Gustav is one ugly storm. It is a category 4 storm that only lost wind speed by 10mph as it passed over land in Cuba today. Even uglier is the path it is taking. 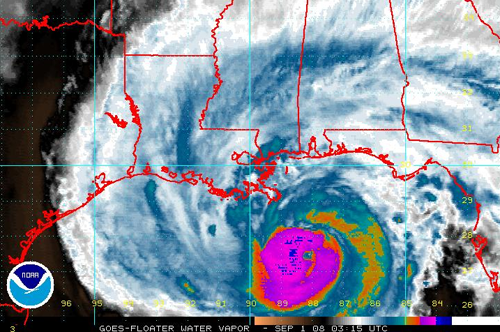 Gustav is taking a steady NW aim toward Louisiana, and perhaps, New Orleans. This is not only a storm to watch for scientific interest, but now for historical interest. Hopefully the human tragedies of Katrina will be avoided this round. Apparently even the Republican national convention will be interrupted. CNN is now reporting that McCain and Palin will be heading to Mississippi in the area of the storm. In light of these events, one has to wonder the full nature of that trip. According to CNN, some republicans are reportedly even talking of using the convention as some sort of telethon to raise support for potential victims. From the club chair in my front room, however, there is an even interesting sub-story developing. The use of emerging Internet communications technologies is being deployed in a large scale already. Here is a use of Ning that will certainly draw attention. Perhaps you can feel proud of the fact that you are already Ning and Twitter savvy. As I type this, CNN has a giant plasma screen on their broadcast to show Twitter responses in regard to the storm and evacuation. So Ning… Ning is versatile. I personally saw its potential for impact in education. It is now being seen as a tool that can be rapidly employed to coordinate action around an emerging crisis. Twitter was used by firefighters of the recent California wildfire outbreak to coordinate services. It will be interesting to see how technologies we are using to facilitate our learning on a day to day basis can be used to encourage and coordinate action in a really spontaneous way. Turn on the TV, turn on the web, turn on Ning and add Twitter to not only the web, but your phone… and connect to the world. The world is talking. Got here through the Ning in Education Site. Your posts always make me ponder things for a bit… That’s good! I see the potential of the use of Ning in several settings–I’m ready for my extended family to have one to help connect us and our busy lives. I can see the benefits of local organizations (i.e. Volley’s schedules, tournaments, announcements) using a networking site. They can be helpful for anything that would be used to disseminate and organize information. @Terri – How weird is it that we live fifteen minutes from one another, and yet we so often find one another in “the cloud?” …the same cloud that people from any spot on the globe can connect to. Very cool. And of course, I agree… Ning is so versatile and getting better all the time. I have another post in the pipeline that deals with Ning. When, oh when, will I find the time to write it?